...Whichever nickname you like better. This is a PNG of a vector. I've been really excited to tackle art for Hasbro's newest Magical Girls. I LOVE the designs! And I really like how DHX translated the child's-drawing concept art of this character. And the fact that Hasbro made THAT into a doll anyway? I really wanted to portray the intimidation I felt when I first saw this character. It was so intense! "But I do NOW!" Awesome voice work, Tara Strong, I loved it! This stained glass took MONTHS to complete. There was SO much going on, my Orion couldn't really handle it toward the end. Characters, settings and objects are from "Equestria Girls: the Friendship Games" and "My Little Pony: Friendship is Magic," copyright Hasbro. The Stained Glass template is inspired by the Stations of Awakening from Kingdom Hearts, copyright Disney and Square Enix. Question? If this was used as a battle scene/boss fight, like in Kingdom Hearts, how would this work; what music(s) would be used in this, who would fight who, and how would it work in a story? Brainstorming, I'd say Sora would team up with Sunset Shimmer (before becoming Daydream), deflecting spells shot by Midnight in the center of the stage, with the ground being a ring of broken-up platforms as it "breaks" into Equestria, while they save students who are hanging onto the edges for dear life. Once all the Mane Six are saved and Midnight's health is depleted enough, Sunset transforms in a cut scene to stop Midnight just like in the movie. I think story-wise, Organization XIII are the ones tampering with her magic-detecting device, and convincing her to release the magic. As for music, I have no idea. One of the more up-beat songs done orchestral and sounding a bit more menacing. I was thinking of using songs from other video games to help, like for me, this would go great with songs like "He who Howl and Rages" from Naruto: Ultimate Ninja Storm 2, "Seeking Answers" from Naruto: Ultimate Ninja Storm 3, and/or "A Beast Roaring in the Tragic Rain, or Ninja Puppetry" from Naruto Ultimate Ninja Storm 4, to give it a more tragic feel but somewhat hopeful feel to it, and to be able to find that up-beat feel like you said, I was thinking "Nega Wisp Armor Phase 2" from Sonic Colors, or "Perfect Dark Gaia" from Sonic Unleashed. So what do you think? Well, why don't you please have a listen of these songs that I've listed, and see what how these musics would work, okay. I honestly felled in love with Sci-Twi. I genuinely adore the way they chose to portray her. She's socially awkward, emotionally and mentally immature,innocently naive, doesn't understand social cues. I could sympathize with her perfectly in that situation. Because I too am very shy and awkward. Despite being the human version of Twilight from the human-verse she's almost an original character. But can I just say that the thing I honestly love about Friendship Games is the build up to Midnight Sparkle. To me what's scary is what you don't see. Sure I knew that Twilight was gonna turn herself into another raging she-demon(No offense Sunset) but I wanted to see the journey. And when she transformed to me it was one of the best if not scariest moments in the film. What I admire is that when the out of control magic was consuming Twilight she didn't cackled like a mustache twirling James Bond villain. She was scared, she didn't knew nor understood what was happening. She literary screamed for help before the sphere of magic consumed her. When she emerged as Midnight Sparkle it was terrifying yet sad at the same time. Ever since the beginning of the movie she was shunned, bullied, mocked, yelled at and peer pressured. I bet after being filled with all of that magic in her body it gave her the opportunity to finally vent all of her anger she built up. Or maybe deep inside she was a very dominant and assertive girl(always the quiet ones). Still she actually one of the most tragic anti-heroes of the franchise. I am however happy that she managed to get a happy ending at the end. I kind of find it surprising that the rest of the Shadow 5 the ones who mocked Twilight were the ones who defended her. It's funny because in the beginning Twilight wanted to move to an independent study group so she could finally be alone and when she got all of that raw Equestrian Magic she wanted to destroy the human world so she could be alone(reminds me of End of Evangelion) yet when Sunset not only stopped her but also saved her from herself from committing the same mistake she did in the past Twilight in a way got the ultimate gift. Not only she found someone who could empathize with but she got not one, not two but several new friends. Friends who did not expected. I loved Friendship Games. It ain't perfect but holy hell was it incredible(to me). 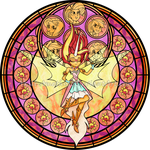 I really hope you do a Stained Glass on Daydream Shimmer and or on a cycle of Human Sunset, Sunset Satan and Daydream Shimmer(Super Sunset as I call it) as a way to symbolize her redemption. I couldn't have said it better myself. The parts they did right were awesome, in the literal sense of the word. I plan on Daydream Shimmer! Hold your Equestrian horses! I love how you have her draining energy from the mane six (including Sunset). It's a nice touch that I didn't notice at first, until I looked closer. I really didn't like Friendship Games...except for the ending. And this is awesome! Yeah, it was a pretty bad movie. lol. But those designs! The shattered bits are a nice touch.